The chairman of the University of North Carolina System’s Board of Governors says board members are still dealing with communication challenges and “high emotions,” but he didn’t offer details. Smith mentioned an opinion piece, penned by 1o former BOG members, that condemned “clearly bad governance” under his leadership. A few members around the table, including former board Chairman Lou Bissette, appeared uncomfortable. Smith, who rose to board leadership a few months ago, has wasted no time establishing a new regime — one that’s more exacting than the environment fostered by Bissette. Like any new leader, he’s faced a gauntlet of political scrutiny — mostly due to his notable involvement in campus policymaking. Under Smith’s leadership, the board has overhauled rules for how universities’ boards of trustees pick new chancellors — a move sparked by concerns about the open chancellorship at Western Carolina University. Two weeks into his role as chairman, Smith led a shake-up of the chancellor search at WCU, unexpectedly declining, along with other board members, to confirm UNC President Margaret Spellings’ pick for the role. The board, after a heated discussion, ordered WCU’s Board of Trustees to start the process from scratch, citing a lack of information about the candidate. The board then decided to rework the search process for university chancellors. Other factors may have rocked the decision. BOG member Tom Fetzer disrupted the WCU search by ordering an outside consulting firm to run an independent background check on Spellings’ candidate. The meddling unnecessarily jammed the board’s decision, Bissette said in a July 26 BOG committee, a story by the News and Observer says. Fetzer formerly was recommended as interim chancellor at WCU by two members of the university’s board of trustees. While Fetzer told CJ he was open to the job, it had no effect on his decision to investigate Spellings’ candidate. New guidelines for chancellor selections clarify no BOG members or university trustees can be considered for a chancellorship unless they resign. BOG members can’t serve on search committees, but can nominate people for those roles. Search committees should look at candidates from a variety of backgrounds, including those outside of academia — business, government, military, and nonprofits. Background checks already are required, and the recommendations state educational and work history, compensation, references, criminal backgrounds, credit history, and social media use should be closely scrutinized. Search committees are encouraged to seek internal candidates and professionals from North Carolina. The full BOG will have seven days to study trustee reviews of candidates. That job used to take 48 hours and was handled by the BOG’s personnel and tenure committee. Confidentiality — a rule many say harms transparency — remains in place for the search process. University employees and students can participate in interviews, but are legally bound to conceal information about candidates. “How many people want to go through job searches with the full public watching? Closed searches protect the candidates’ interests, and they also avoid this unnecessary cattle call where candidates are dragged through the mud,” Long said. It’s great to have clearly outlined rules, but the overhaul had nothing to do with what happened at WCU, Long said. 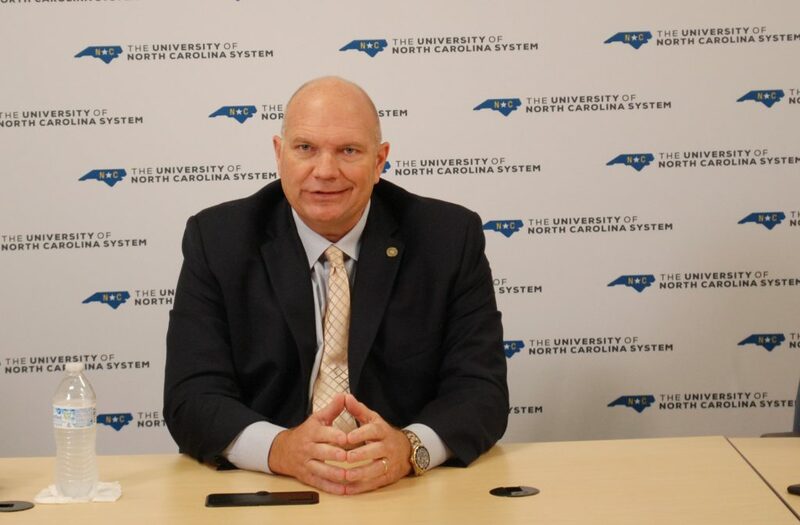 East Carolina University Chancellor Cecil Staton also has faced criticism from Smith. The statement was unacceptable, Smith said in the email. “It’s been a scandalous couple of years at ECU that has and continues to embarrass our great university,” Smith wrote to Reps. Gregory Murphy, R-Pitt, and John Bell, R-Craven. “Leaders take accountability, and they don’t point the finger. I’m happy to sit down with Cecil and explain in great detail the many issues we have had under his leadership that he was in direct control over that has greatly hurt and divided ECU,” Smith told Bell and Murphy. Kieran Shanahan, chairman of ECU’s BOT, later told CJ that the letter turned out to be unnecessary. Rumors that Staton’s job was in jeopardy were false, Smith told CJ in an August interview.